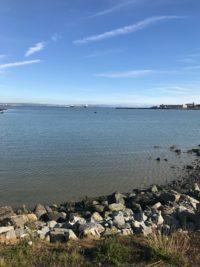 In the southeast sector of San Francisco, where the shoreline faces the bay, there lies a finger of land known as Heron’s Head Park. 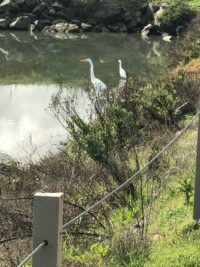 Located just blocks from the postal substation on Evans Street in the Bayview district, the park is so named because, from the air, the land resembles the head of a heron. Heron’s Head Park is owned by the City and managed by the Port of San Francisco. It is the perfect place to take a short walk and to experience a lesser-known part of the waterfront. It is a place where one can find peace and solitude and wonder at its mere existence within our urban environment. Heron’s Head is not a natural body of land, but rather, is built on landfill that originally was intended as the foundation for a new shipping terminal. Though the terminal never came to fruition, wetlands formed around this sliver of land, creating a safe habitat for birds and marine life. 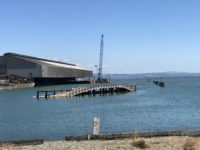 Like much of San Francisco’s southeast waterfront, the Bayview is undergoing rapid growth and change. 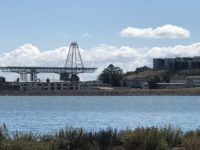 Once home to butcheries, shipbuilding and other industries, the Bayview and its near neighbors, Dogpatch and Mission Bay, are now better defined by new housing, shopping, sports stadiums, and the medical and biotech industries. This is one of the reasons that Heron’s Head Park is special. It is near to the new heart of San Francisco, yet still an oasis from city life. On a recent excursion to Heron’s Head, I found myself chatting with a woman named Barbara with her dog Dusty. I showed her a photo of two egrets I had taken minutes before, and she pointed out the differences between the two. One was a Great Egret, with a yellow bill and black feet, and the other, a Snowy Egret, with its yellow feet and black bill. Barbara pointed out a place by some trees, beyond the reach of the path, nestled in the salt marshes, favored by three Great Blue Herons. She herself had spotted Black Oystercatchers that same morning, black birds with long orange beaks. Black Oystercatchers favor rocky shorelines and mate for life. Barbara explained to me that the third bird of the trio was one of the surviving offspring from last season’s nest. Today, because of the wetlands restoration, Heron’s Head Park is a birder’s paradise. In just 25 acres of land, the park is home to 100 species of birds, both local and flyover. As evidenced, it is not difficult to catch sight of a Great Blue Heron or egret. Hundreds of shorebirds gather along the banks of the bay and in the wetlands, including mallards, cormorants, grebes and loons. Red tailed and red-shouldered hawks circle the sky overhead in search of prey. Hundreds of gulls perch on the old container ship pier just to the north. Migratory geese and ducks, following the ancient Pacific flyway, are prolific in Heron’s Head Park. Heron’s Head Park is now part of the Bay Trail, which leads to another park and fishing pier at India Basin. A path, benches and signage guide the way. Near the entry to the park, below the EcoCenter, a bridges crosses over the wetlands and leads to where the old Hunter’s Point Power Plant was once located. The plant was closed in 2006. Following years of cleanup and soil mitigation by Pacific Gas and Electric, the restoration of this part of the trail was completed in March 2017, complete with signage, benches and a proliferation of native plants. This part of the city, formerly home to industry and pollution, is still evolving. Before the arrival of Europeans, over 10,000 Ohlone Indians lived along the shores of the Bay. The size of the San Francisco Bay and shoreline have vastly shrunk since those days due to construction and landfill. Today, the preservation of the Bay and the wetlands is more important than ever. Visitors come to Heron’s Head Park for its EcoCenter and education programs, a dog run, and a native plant nursery, as well as its views of nature. A recycling industry co-exists side by side with the restored wetlands. 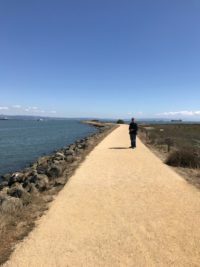 The Bay Trail will continue to expand, with the eventual goal to ring the entire San Francisco Bay with trails that are open to the public. Come to Heron’s Head Park with your binoculars and see what progress has been made. You do not have to be a bird expert to see the amazing numbers of waterfowl that have made this part of the city their home for centuries. How delightful!! I can’t wait to go next time we are in San Francisco! Marcia, I’m evidently back in the loop. I was excited to get an e-mail notification of this, your most recent post. 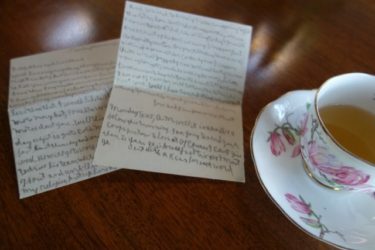 What a great article about an apparently little known treasure in S.F. 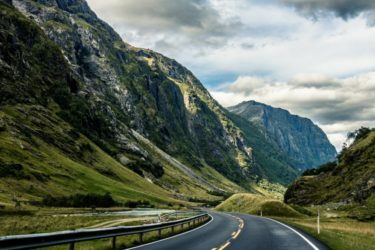 I’m going to forward it to friends in the Bay Area who might like to explore the area, and also catch more of your posts. Stamps: What’s Not to Like?